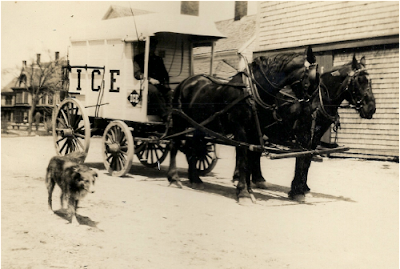 Recollecting Nemasket: "Remember the White Wagons"
A century ago, spring marked the annual appearance of ice wagons on the streets of Middleborough, making their rounds delivering ice to both residences and commercial establishments. One of Middleborough’s two principal ice dealers in the early 20th century, Ernest S. Pratt typically began advertising ice for sale in April of each year at the approach of the warmer weather. Following its establishment, the Ernest S. Pratt Company initially delivered ice around the town in a wagon drawn by one horse. During the 1910 season, a two horse team was added to the equipment, and between the world wars Pratt operated two double teams, a single team and a truck to make deliveries, so great was the demand for ice. 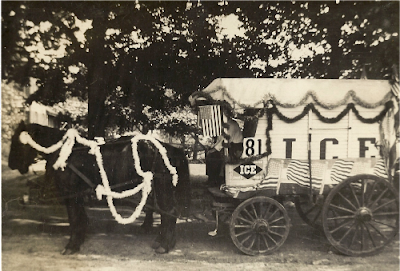 Pratt’s ice wagons were painted a brilliant white and featured the word “ICE” prominently upon the sides. Additionally, red diamond-shaped signs were secured to the panels of the wagon, a feature noted in his advertisements in April, 1915, which urged patrons to “watch for the white wagon with the red diamond sign”. Later advertising similarly implored readers of the local news to “remember the white wagons.” These wagons were built expressly for the purpose of hauling ice, and at least one of Pratt’s was built by J. B. McLane of North Reading, a large manufacturer of market, store, express, milk and meat wagons. Pratt paid McLane $310 for the wagon in May, 1911. Delivering ice was a grueling task, one which frequently occupied the day between 6 a. m. and 9 p. m. While drivers were engaged in feeding the horses before harnessing them, a lone man would be in the ice house on the Pratt Farm hauling out the cakes of ice with which the icemen would fill their wagons. Once the ice wagon was full, the ice man would begin his route. The delivery men carried a piece of ice, sometimes to a third floor apartment, with a pair of ice tongs, draped over his back and resting upon a rubber pad which protected him from the cold, wet ice. Sometimes, in the case of smaller pieces, a canvas bag was used for transport. The men would guess fairly closely as to the size piece the customer would use between deliveries. To be on the safe side and prevent a second trip, a slightly larger cake of ice was carried and trimmed to fill the ice compartment at the top of the chest. The remainder was returned to the ice wagon in the canvas bag. Additionally, each of Pratt's wagon had a separate compartment for crushed ice so patrons desiring this article could be easily accommodated. The sale of crushed ice also minimized waste as smaller and oddly-shaped pieces of ice could be salvaged. Many times, especially during the hot summer months, children along the ice routes would follow the wagons and treat themselves to some of the smaller pieces or the chips from the tail gates or canvas delivery bags. Pratt delivered ice to residences four times weekly during the hottest weather – Mondays, Wednesdays, Fridays and Saturdays. “Mondays and Saturdays were long, busy, days for the drivers. The wholesale trade to market was made on Tuesdays and Thursdays …. Everyday the weather was really hot, the telephone rang repeatedly,” recalled Pratt’s wife, Rose Standish Pratt. Drivers for Pratt included Leslie “Pop” Gates, Bill Gardiner, Ed Ouelette, Lawrence Thomas, Harris Tripp, and Bob Hopkins. Bill Gardiner, later Chief of the Middleborough Police Department, was employed by Pratt for nineteen years between 1921 and 1940, and worked as a driver. Gardiner’s first task each day was to replenish the ice in the water coolers in both the Leonard, Shaw and Dean and George E. Keith shoe factories which had two water coolers on each floor. The remainder of Gardiner’s long day was occupied by deliveries on the West Side and North Street neighborhoods. Later, Gardiner graduated to a double team, working with Leslie Gates, and he lastly drove the company truck, peddling ice, bagged wood, coke and charcoal. While the work was generally not hazardous, it could prove toilsome. In the evening, large quantities of hay were placed into the horse stalls as the animals could not be fed during the daytime when they were making their rounds. Pratt was known to have treated his horses well. Only one is known to have suffered incidental to the delivery of ice and that under decidedly unusual circumstances. Following war games in the vicinity of downtown Middleborough on August 2, 1913, activity which was accompanied by much noise, one of Pratt’s horses became deaf: “Ernest S. Pratt has reported to chief Swift that his horse became deaf as a result of the heavy shooting incidental to Saturday’s battle.” Without hearing, the horse was of no use on the delivery route, and Pratt was compelled to sell it. Eventually, the local ice wagons began to disappear between the two World Wars. Pratt’s Adams model truck was the first ice truck in Middleborough, and was added to the farm about 1919. Subsequently others were added, and the familiar white wagons which Pratt once urged customers to remember became a thing of the past, each replaced by a new truck. Ernest S. Pratt Company Ice Wagon, Middleborough, MA, photograph, July 4, 1919. 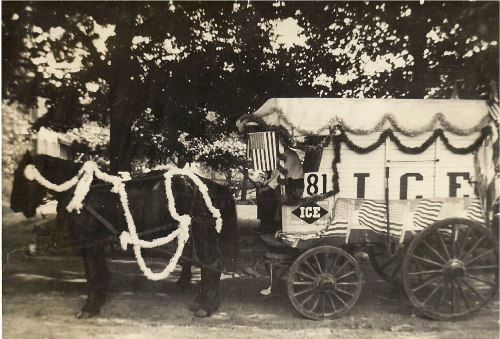 One of Pratt's ice wagons is decorated here for the Independence Day parade of July 4, 1919. Noticeable is the red diamond sign marked "ice" which was a feature of Pratt's local advertising. Lelsie Gates in Ernest S, Pratt Company Ice Wagon, Pratt Farm, East Main Street, Middleborough, MA, photograph, c. 1920. Gates was a long-time employee of Ernest S. Pratt. Here he is seen aboard one of the company's ice wagons in front of the large barn at the Pratt Farm.